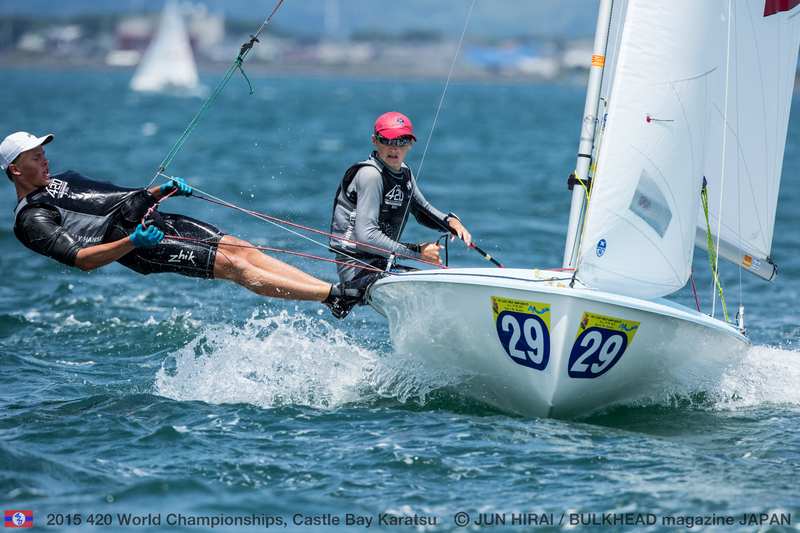 The wind served up a tricky opening day for the Race Committee and 165 teams on day one of the 2015 420 World Championships in Castle Bay Karatsu, Japan. 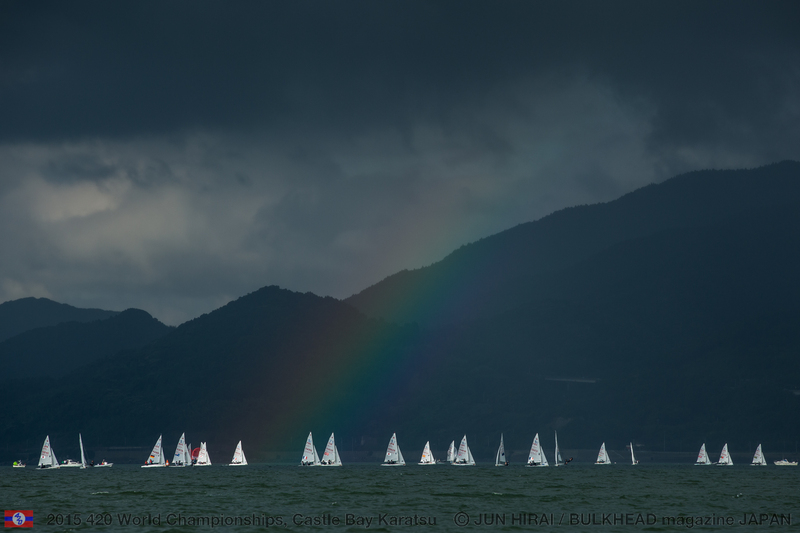 A massive wind shift forced the abandonment of race 1 for the 420 Open yellow and blue groups, before the Race Committee managed to get racing underway again when the breeze stabilized. Eyes out of the boat was the secret to success, with every puff making a difference. 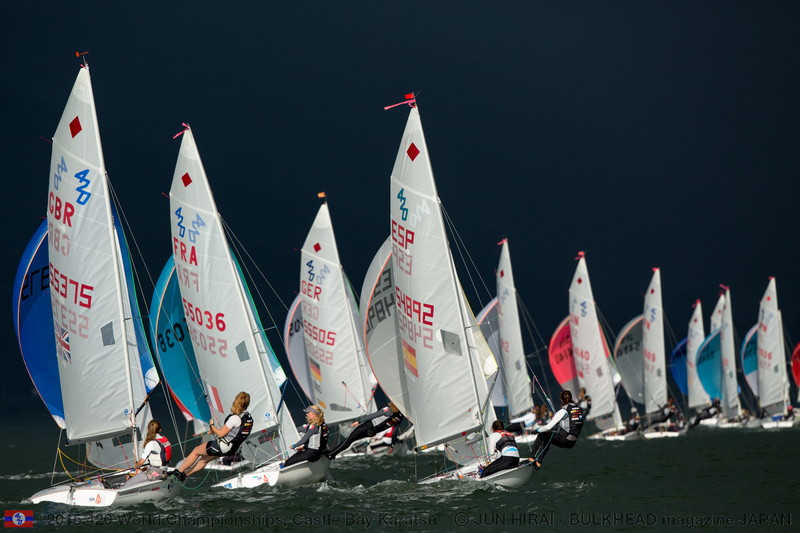 Localised rain made the wind very unstable, and ultimately it was only the 420 Open yellow group and 420 Ladies white group who completed a race. 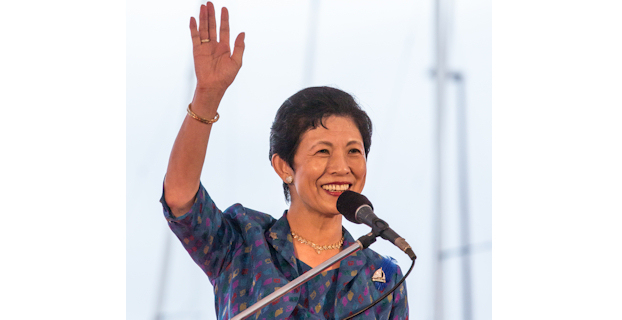 Her Imperial Highness Princess Takamado-no-miya Hisako of Japan, Honorary President of Japan Sailing Federation, returned to the 420 Worlds today, chatting to national teams in the boat park before heading out to watch the racing. Sharing her chat with the 39-strong Japanese team, the Princess said, “When I spoke to them earlier they seemed a bit tense. It will be a good learning experience for them though and they have the great Olympic silver medallist Yumiko Shige here that they can look up to. 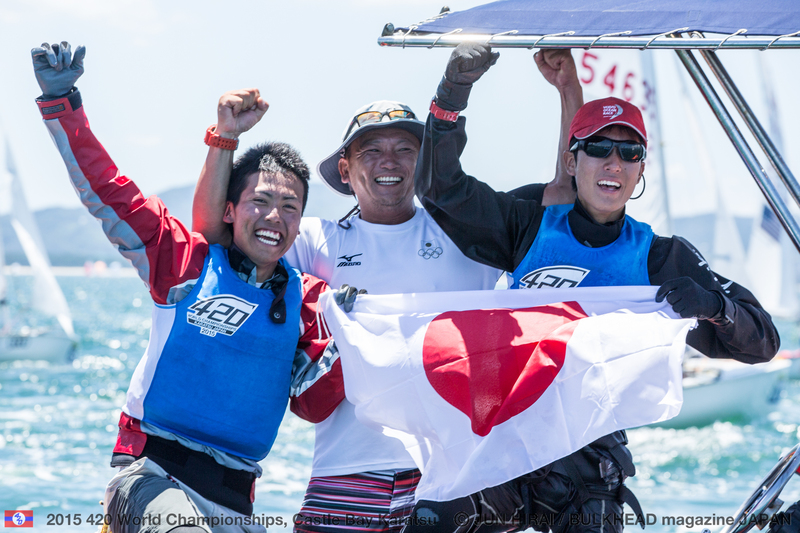 Entries to compete at the 420 World Championships are highly prized, with nations restricted to a quota of 7 entries in each of the 420 Open and 420 Ladies Championships and 6 entries in the U17 Championship, ensuring the fleet is a gathering of the very best 420 sailors from around the world. 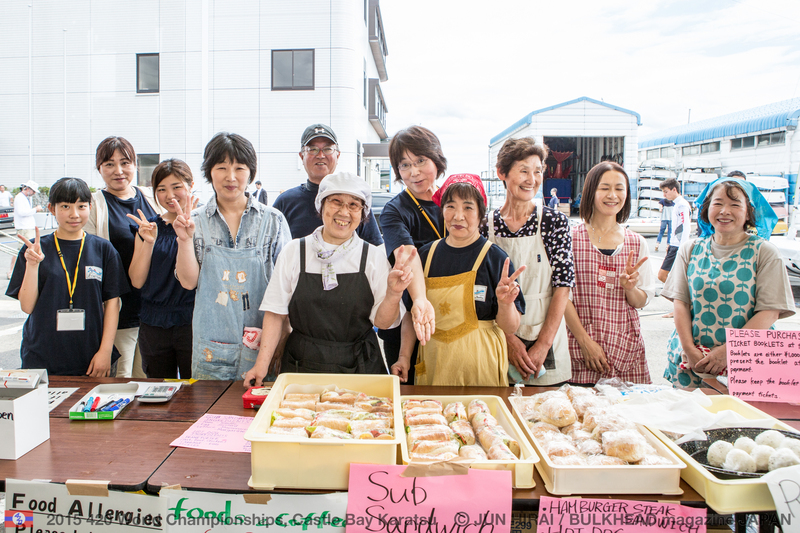 As host nation, the entry quotas for Japan are doubled. Racing got back underway soon after 1500 hours, when the first attempt on race 1 for the 420 Open yellow and blue groups was abandoned halfway through. Up on the track first was the thirty-five boat 420 Open yellow group. 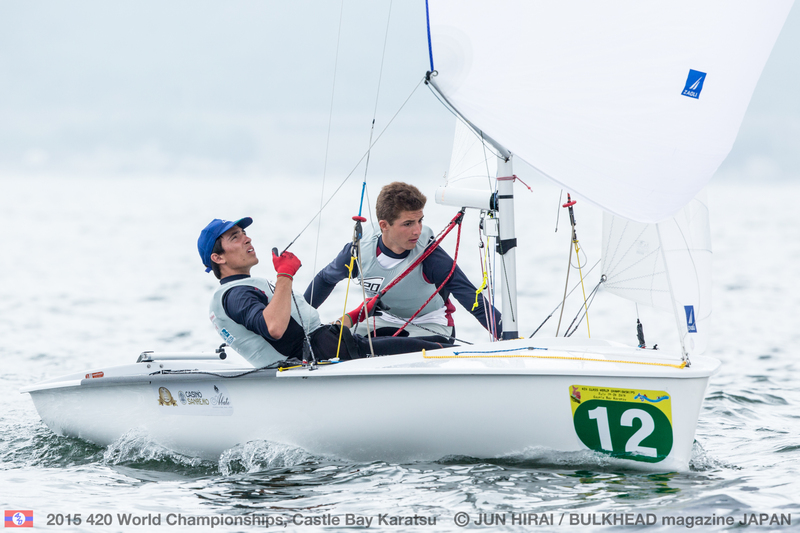 Maxime Pedron/Eliott Michal (FRA) claimed the lead at the windward mark, hunted down by Guglielmo Frangi/Pietro (ITA) and Manuel Palacin/Alfredo Davila (ESP), with Max Clapp/Ross Banham (GBR) in fourth. Leaderboard changes on each leg saw a quite different order by the time the fleet crossed the finish line. As the race unfolded, Italy’s Giovanni Pizzatti/Anna Poli (ITA) read the track best to take the gun and bank a winner on the opening day of the Championship. Experience counts, and Pizzatti and his crew Poli have bags of that to take possession of the race track. 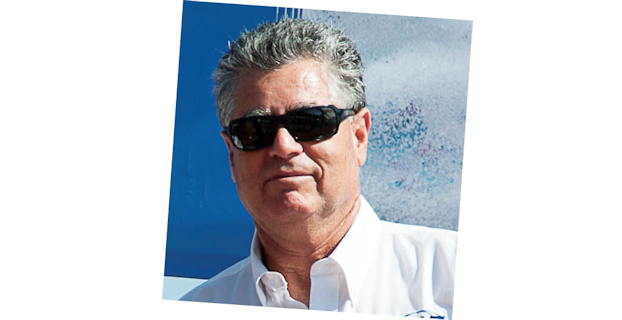 Aged 32, Pizzatti is the oldest sailor competing, having previously enjoyed an illustrious career in the 420 in the early 1990’s, before focusing on his career in engineering. Racing with his fiancé, Anna Poli, Pizzatti has taken a step back in time and proved that despite an absence he is still as competitive as ever. 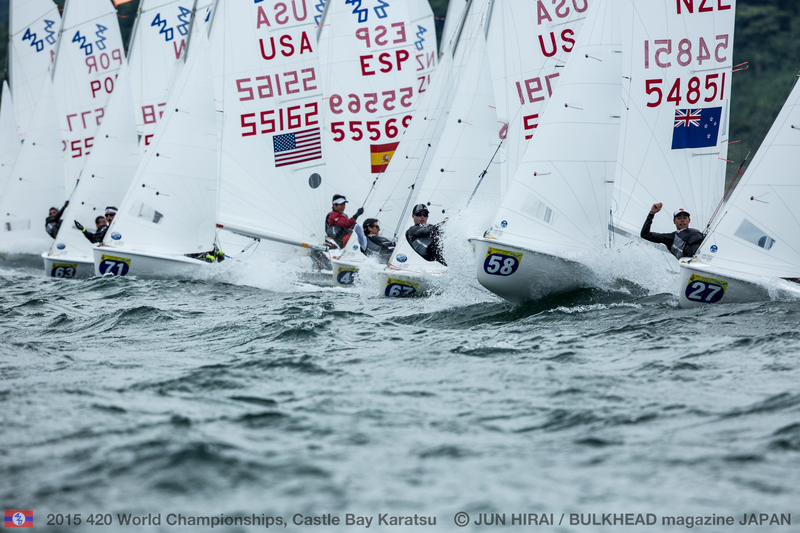 Max Clapp/Ross Banham (GBR) found themselves quite deep in the fleet on the first attempt to get race 1 for the yellow fleet underway, so relief for them as they turned their result around when it really mattered, finishing in 2nd overall in the only race for the yellow group. A strong early showing from Singapore’s Jia Yi Loh/Matthew Scott Lau who crossed the finish line in 4th. 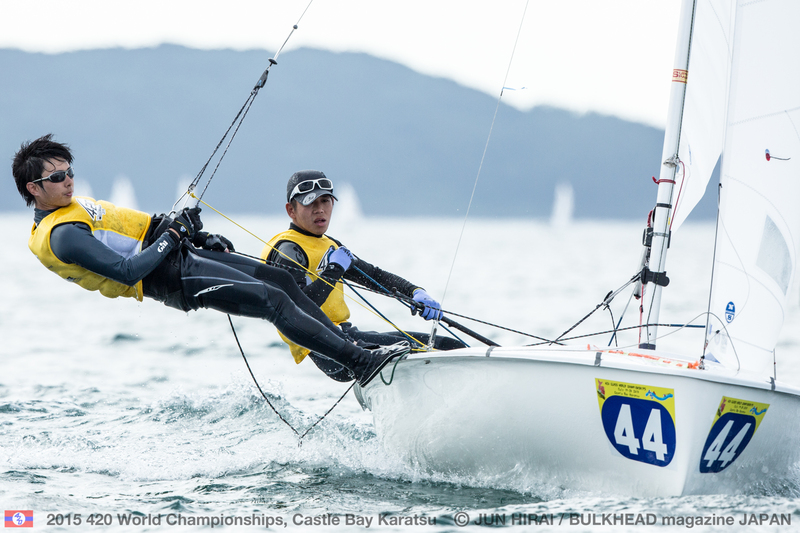 The pair were the top placed Singaporean team at last year’s 420 Worlds in Germany, finishing in 7th overall. The Race Committee got both the 420 Ladies pink and white groups opening race underway, but it was not to be for the pink group, with racing abandoned. The white group completed their race, with victory to Greece’s Anastasia Gkari/Vikentia Pateraki in their first ever international event, in a boost to their profile. Second to Mari Bover Guerro/Clara Llabres (ESP) and third to Rio Demi/Maria Coluzzi (ITA). Massive disappointment last year, as the team went from the excitement of the 2014 420 Worlds Opening Ceremony to being relegated to sit out the Championship due to illness. Since then, their racing career has kept them in Greece, with the 2015 Worlds marking their first ever international event in the 420. Defending 420 Ladies World Champion, Carlotta Omarri/Francesca Russo Cirillo of Italy opened their defence with a solid 4th place finish. 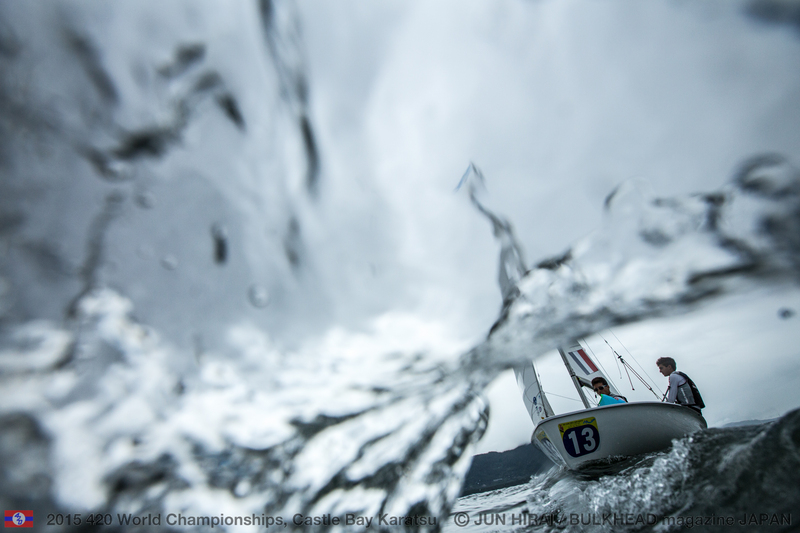 No racing for the U17 fleet, who will resume their scheduled 12 race series tomorrow. Anticipating a similar forecast on Tuesday 21 July, the Race Committee are bringing the scheduled start time earlier. The first warning signal for 420 Open Blue, 420 Ladies Pink and 420 U17 is scheduled at 1100 hours. The intended starting order will be: Start 1: 420 Open Blue – outer loop, Start 2: 420 Ladies Pink – inner loop, Start 3: U17– inner loop. The first warning signal for 420 Open Yellow and 420 Ladies White is scheduled at 1400 hours. The intended starting order will be: Start 1: 420 Open Yellow – outer loop, Start 2: 420 Ladies White – inner loop.